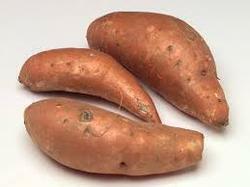 Our firm holds expertise in offering a wide variety of Sweet Potatoes. Grown in highly fertile soils, these are well stored in a hygienic facility. Moreover, our procuring agents check the freshness and health of these sweet potatoes before sourcing these. 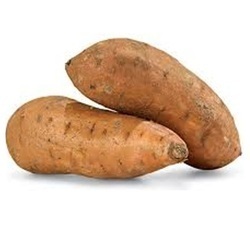 Sweet Potatoes are known to be rich in vitamin C, B6, diberty fiber, potassium and manganese. In order to keep pace with the never-ending demands of customers, we are involved in offering a wide range of Sweet Potato. Packed Type : 20 / 30 / 40 / 50 Kg Mesh Bag / jute Bag. We are backed by modern transit facilities and thus while located in Bangalore(India), we are able to reach any destination easily. Our company is well versed with online as well as traditional payment methods. As per requirements of patrons, we can sign an agreement for payment with suitable terms and conditions. We procure sweet potatoes from various farmers across Uttar Pradesh, Orissa, West Bengal, Madhya Pradesh & Chhattisgarh. We are presently exporting to Gulf, Far East, Maldives & Mauritius. Our company holds immense experience in this domain and is involved in offering wide assortment of Sweet Potato.